Specific Shoes for Specific Jobs: Don't Forget Your Feet! Athletic footwear should be fitted to hold the foot in the position that's most natural to the movement involved. Athletic shoes protect your feet from stresses encountered in a given sport and to give the player more traction. The differences in design and variations in material, weight, lacing characteristics and other factors among athletic shoes are meant to protect the areas of the feet that encounter the most stress. A running shoe is built to take impact, while a tennis shoe is made to give relatively more support, and permit sudden stops and turns. 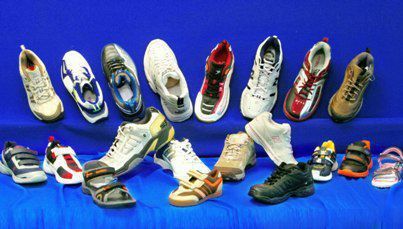 For sports, "cross trainers" are fine for a general athletic shoe, such as for physical education classes. Cross-trainers, ideal for stair machines and weight-lifting, provide more lateral support and less flexibility than running shoes and may be heavier. You don't need light, flexible shoes for cross-training. But if a child is involved more heavily in any single sport, he or she should have a shoe specifically designed for that sport. Our practice recommends sturdy, properly fitted athletic shoes of proper width, with leather or canvas uppers, soles that are flexible (but only at the ball of the foot), cushioning, arch supports, and room for your toes. Try a well-cushioned sock for reinforcement, preferably one with an acrylic fiber content so that some perspiration moisture is "wicked" away. Soccer shoes should offer a reinforced toe, wide toebox, soft leather, field-appropriate cleats, well-padded soles and a support system that can help prevent ankle sprains and knee injuries. Tennis shoes should provide good arch support, a reinforced toe, a roomy toe-box and a comfortable collar in the back of the shoe. If the collar is too high, it rubs against the Achilles' tendon, a problem frequently experienced by tennis players. Basketball shoes should provide support for lateral movement and extra stability to guard against ankle sprains. Proper basketball shoes have lots of ankle support and shock absorption. Some high-topped shoes offer more ankle support than others. Shoes should fit well and be replaced before the soles become smooth, or before the uppers begin to tear or come apart. A typical basketball shoe should be replaced every two to three months for five days a week worth of play. Acrylic socks should be worn to avoid blistering. Cycling enthusiasts will admit that shoes are the most important piece of cycling equipment next to their two-wheeled ride. Cycling shoes must have a stable shank to efficiently transfer power from your feet to the pedals. Good shank support will prevent the foot from collapsing through the arch while pedaling. This could cause arch pain, tendon problems, or burning under the bottom of the foot. A rigid shank protects your feet from the stress of pedaling. If you have a pre-existing problems with your feet or wear shoe inserts, invest in a cycling-specific shoe. Most special shoes prescribed a doctor control the arch and heel, and for cycling, usually require critical forefoot balancing. Riders with mild bunions or hammertoes should select a wider, deeper shoe that will accommodate the deformity. Cycling shoes are usually categorized by racing and mountain biking. If you are not an avid cyclist and have no known foot problems, cross-training shoes will usually provide the necessary support across the arch and instep. They also provide the heel lift that cycling shoes give. Combination cycling-hiking shoes meet the needs of the casual rider well, and have recently become popular. More serious cyclists invest in toe clips, which range from traditional to the newer shoe-cleats called "clipless systems," which resemble ski bindings. If you already wear special inserts in your street shoes, transfer them to your golf shoes. Some special shoe inserts are designed specifically for golf shoes and will be different than those designed for street shoes. Running and jogging exert brute force on your feet, legs, hips and spine. Proper shoe selection is very vital to protecting these from injury or long-term problems. Fit the shoe to your longest toe, which is often your second toe. You should have at least 1/4 inch of space beyond your longest toe. Weight, foot structure, and running regimen are all deciding factors. Be mindful that all shoes have a different shape, and sizes and widths are not uniform from shoe to shoe. Consider whether a special insert will be placed in your shoe, and whether your running style is flat-footed or on the balls of the feet. Shoes should provide cushioning for shock absorption, and ought to be able to fully bend at the ball of the foot area. Experts advise that if you plan to play tennis, buy shoes designed specially for the sport. Running shoes, for example, are not designed to allow for the side-to side sliding common in tennis. Running shoes have too much traction and may cause injury to the foot and ankle. In addition, running shoes don't have padded toe boxes, which leads to toe injuries for tennis players. Heels in tennis shoes should be snug-fitting to prevent slipping from side to side, and both heel and toe areas should have adequate cushioning. The arch should provide both soft support, and the toe box should have adequate depth to prevent toenail injuries. Our practice can recommend a shoe that is best for your foot. When shopping for tennis shoes, try on several pairs with tennis socks. Put on and lace both shoes and walk around for a minute or two. Make sure your ankles don't roll in the shoes. For more information on the proper shoe for your sport, see a podiatrist. If you are in Northern New Mexico, please call (505) 982-0123 or visit us at www.FootAndAnkleSantaFe.com to schedule an appointment.